In the early seventies there was a revolution going on in music making. An all electronic instrument, the sound synthesiser, was making a new sound world available to musicians. When I heard what these instruments could do, I was hooked. I wanted one! The trouble was that they were expensive; far too expensive for me. But, I was determined and I did have some electronic knowledge and building skills accumulated since childhood... so the only answer was to try to build one. The first one was based on a design (around 1972-3) from the electronics magazine “Wireless World” (picture right). It took sometime to make the case, fabricate the metal work and make printed circuit boards. After all the effort I found that It worked but it wasn’t satisfactory; the temperature stability was particularly poor. So I ended up modifying it extensively until I was happy with it, I was, by this time, hooked! Then, hmmm..., my eyes started to glaze over as I started to think bigger! This was the result. 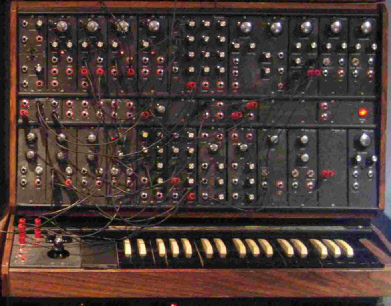 Completed in the following year, it was a large modular synthesiser that looked a bit like the big Moog series C synthesisers that were available at the time. None of the circuits are like Moog’s though. It has over 20 separate waveform generating and processing modules, plus the keyboard, all of which can be plugged together with patch cords. The patching permutations are huge and so is the range of synthetic electronic sounds that can be produced. It can also be used to process any recorded sound fed into it. For tuning stability it’s wholly a Hz/volt based system. The keyboard came from that first synthesiser and was re-housed with a 2 way + rotary joystick and portamento effects. Across the top L-R are 1 dual control voltage processor, 4 VCOs, 4 x 3 mixer, 1 VCF/Oscillator with switched numerous filter types, 2 low pass VCFs and 1 high pass VCF. The middle panel has in/out lines to sockets on the back, computer control lines and triggers, a pre-amp, common jacks and 2 fixed 5 volt potential sources. Along the bottom row L-R are 3 VCAs, 1 dual LF oscillator module, 2 Envelope generators, 2 1 x 3 mixers, 1 trigger delay, stereo reverb, noise source and 1 noise gate with trigger outputs. To program it and operate the processor a simple keypad and a six digit LED display is used. My machine code software initially took up 2KB of memory burnt to an EPROM chip. Sequencing program data was stored on the cassette recorder to the right. 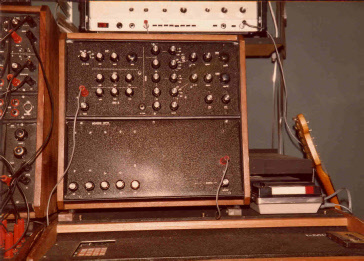 Sequencing consisted of one voltage control pitch line with envelope triggers and one percussion line of percussion triggers. Many sequences could be entered and several master play lists could be used to sequence the sequences. Enough data could be held in the microprocessor to do a complete set. I think I had to re-load during the break for the second set of a gig. The square case above the processor contains two panels :a small 2 oscillator dedicated pre-wired synthesiser (top panel) and a simple 5 voice electronic percussion unit (lower panel). 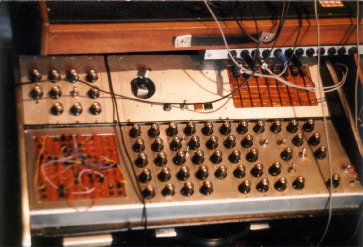 The percussion effects were developed on the main synthesiser and then dedicated circuits made up for each sound. It was very basic with a bass drum sound, 2 snare type drum sounds, a clave and a hi-hat sound; that’s all. The sound was definitely unique. I was going to add more sounds to that but never got around to it. It seemed enough at the time. The synthesiser voltage control interface was an 8 bit digital to analogue convertor and the the 9 percussion and envelop triggers ran straight off the micro’s on-board output ports. Sequencer data had to be loaded into memory by hand in hexadecimal code, requiring much patience! Agghh! (Roll mouse over for bigger view).